They said it wasn’t going to happen, but now it is. It seems that whenever Blizzard says “never” we should take it as “not at this time, but we reserve the right to change our minds.” So flying is officially actually going to happen. Have a tier 3 Garrison and enough Garrison Resources to build that shipyard that’s coming in 6.2. Do all the quests in all the zones. This gives you the Loremaster achievement. Completely explore all of those zones, getting the exploration achievement for each. Find 100 of those treasures that are scattered about all the zones of Draenor. The HandyNotes addon (from curse or curseforge) will mark all of the teasures, and other things, on your maps. Do those daily Apexis quests that you love so much. There are 12 of them. And no, just grinding up the crystals through other means or garrison missions won’t do it. You need to “Secure Draenor” and do ’em all. You can buy any of the missions that you haven’t done for 200 resources from the Garrison Stuff dealer in front of your town hall. Do a whole bunch of quests in the new zone, Tanaan. This is the zone where you entered Draenor and then left to form your Garrison. Now you can go back. The goal of the quests is to get Revered reputation with three factions in Tanaan. Four or five minutes work, right? Doing all of this gets you the meta-achievement Draenor Pathfinder. Once you have that you might still have to wait a bit, as flying won’t actually be enabled until a small patch after 6.2. Actually, I think it’s a pretty interesting comprise from Blizzard’s original “No Flying in Draenor” announcements. Blizzard wants us to explore all those places which they put so much work into. Now they’ll reward us for it. I wouldn’t be at all surprised if those World PvP guilds decided to require this achievement. Better get working on it now, and you’ll have a lot of or most of it done by the time flying goes live. And yes, this will be a lot more interesting to do on your PvP server than a PvE server. Zygor will help you with the leveling, loremaster, reputations, and more. Go here and check it out. 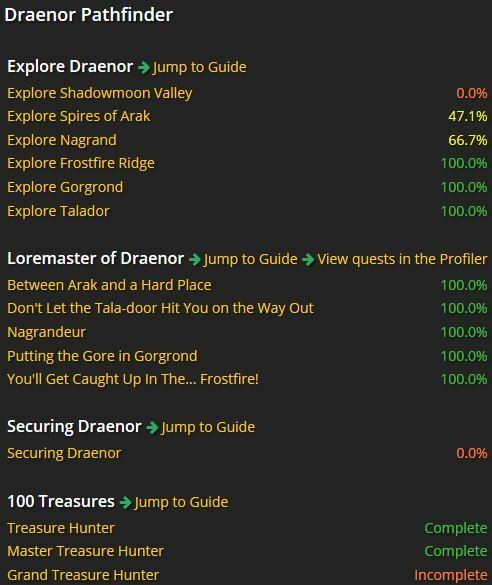 WoWhead has a flying tool that will help you to check your progress towards the Draenor Pathfinder achievement. Just enter your realm and character and go. They said it wasn't going to happen, but now it is. It seems that whenever Blizzard says "never" we should take it as "not at this time, but we reserve the right to change our minds." So flying is officially actually going to happen.